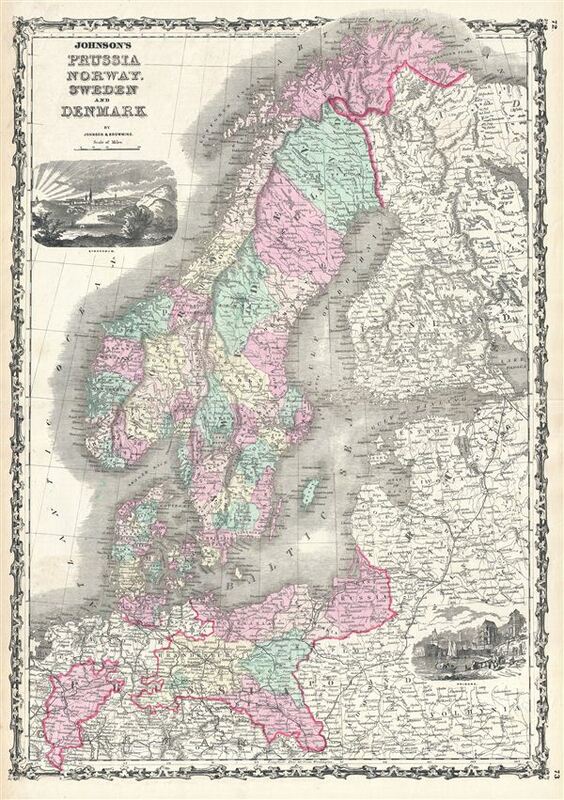 This is a beautiful example of A. J. Johnson and R. Browning's 1861 map of Scandinavia and Prussia. It depicts all of Sweden, Norway, Finland, Denmark and Prussia, as well as parts of estonia, Latvia and Lithuania. There are two decorative city views, Stockholm in the upper left quadrant and Cologne in the lower right. Various towns, cities, railways, rivers and several other topographical features are noted with relief shown by hachure. This map features the strapwork style border common to Johnson's atlas work from 1860 to 1863. Published by A. J. Johnson and Browning as plate nos. 72 and 73 in the 1861 edition of Johnson's New Illustrated Family Atlas. This is the last edition of the Johnson Atlas to bear the 'Johnson and Browning' imprint. Subsequent editions reflect Ward's 1862 acquisition Ross C. Browning's shares in the firm. Very good. Typical wear long original centerfold. Blank on verso.